For most of the country, summer is the time for DIY projects, garden clean outs, and home renovations. But for those of us blessed to live in the South, fall marks the season for outdoor projects. Autumn gives Roswell homeowners the ideal weather to remove old shrubs, renovate the outdoor living area, and build new spaces for garden storage. 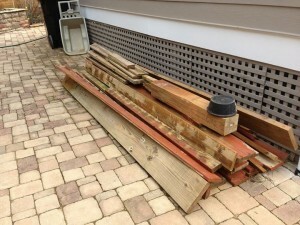 If you’re giving your home a pre-winter makeover, make sure you don’t leave renovation debris to blemish the new view. If you’re undertaking a major home renovation project, you might be tempted to rent a dumpster or buy a Bagster. Dumpster rentals, however, are rarely worth the hassle, and Bagsters cause more grief than relief. Unless you’re generating a house-worth of leftover materials, the best way to remove renovation debris is a junk removal company. Snap a photo and send it to Mr Junk, use the How We Price tool on our website, or call us to get an estimate over the phone. Because Mr Junk is a locally owned company, you’re guaranteed the best service, the best prices, and the quickest junk removal in Roswell. We can’t tell you how many times we’ve hauled stacked building materials from a new deck, only to find the wood underneath dirty and discolored. The longer you ignore renovation debris, the higher the risk that it will damage your property or cause an injury. What’s more, leaving leftover building materials in the yard ruins the curb appeal of redoing the porch or adding an outdoor living space to your property. Instead of wasting time and effort hauling your own debris in a borrowed flatbed, call the professionals. Mr Junk won’t just load waste materials in our truck and drive off; our team promises to stick around and sweep up afterwards, too. Tired of staring at that pile of old timber? Do you have dusty cabinets taking up storage space? Call Mr Junk to haul off the remnants of your old home so you can focus on enjoying your newly renovated home.